For millennia, Latin has served as a lingua franca for administrative, scholarly, religious, political, etc. 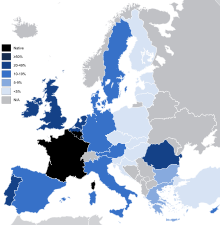 purposes in the area of the present-day European Union. After the unique case of Athens and other Greek city-states of the 6th to 4th centuries B.C., the first documented political entity historically verifiable in Europe was the Roman Republic (traditionally founded in 509 B.C.) - the successor-state to the Etruscan city-state confederacies. 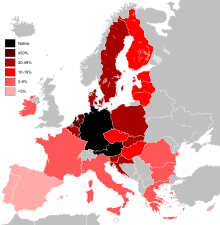 Latin as a lingua franca of Europe was rivalled only by Greek. It still served as the official language in universities in the 20th century, and has operated as the official language of the Roman Catholic Church until today. Latin, along with Greek, has been at the core of education in Europe from the schools of rhetoric of the Roman Republic in all of its provinces and territories, through the medieval trivium and quadrivium, through the humanists and the Renaissance, all the way to Newton's Principia Mathematica Philosophiae Naturalis (just to name one example of thousands of scientific works written in this language), to the public schools of all European countries, where Latin (along with Greek) is at the core of their curricula. Latin served as the undisputed European lingua franca until the 19th century, when the cultures of unwritten languages and the "national languages" started to gain ground and claim status. Today, several institutions of the European Union use Latin in their logos and domain names instead of listing their names in all the official languages. For example, the Court of Justice has its website at "curia.europa.eu". The Court of Auditors uses Curia Rationum in its logo. The Council of the European Union has its website at [www.consilium.europa.eu] and its logo showing Consilium. The European Union itself has a Latin motto: "In varietate concordia". Under the European Company Regulation, companies can be incorporated as Societas Europaea (Latin for "European Company", often shortened to "SE" after the company's own proper name). Latin is one of the languages of IATE (the inter-institutional terminology database of the European Union). ^ Gino Dino, 11 December 2015, [slator.com], retrieved 1 March 2016.